Mrs. Carolina Anna Isley, age 93, passed away Sunday, July 30, 2017, and was known as Nina by family and friends. She was born in Muskegon, Michigan on January 12, 1924 to Haddon & Fay (Walls) Edlund and married Nobel "Ding" Isley on September 22, 1950. Mrs. Isley had been employed as a receptionist for Dr. Marvin Meengs Office and Hackley Hospital until retiring in 1996. 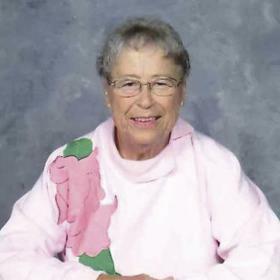 Nina was a life time member of Lakeside United Methodist Church and the Beachwood/Bluffton Association. She enjoyed participating in the church circle, church choir and making ceramics. Perhaps Nina's most beloved past-time was visiting with friends over the years. Brother, Edward Edlund of IN; nieces & nephews, Susan Valk, Mari Fuhrman, Chris Pothoff, David Edlund, Doug Edlund, Gary Pothoff, Dawn McQuarie; 16 great nieces & nephews; 20 great great nieces & nephews. She was preceded in death by her husband Nobel "Ding"; sister, Eleanor & brother-in-law, Bill Pothoff; sister-in-law, Alice Edlund; nephew, Charles Pothoff. Monday, August 7, 2017, 2:00 - 4:00 pm at Clock Funeral Home- Muskegon. MEMORIAL: Bluffton Neighborhood Association or Hospice of Michigan.